Beautiful! I'm making this one too! I love the beads- mine is Coral with iridescent reddish-pink beads. I love your blog- I've never commented before, but I had to on this one! I'm working on this also, and I just finished the row with 10 beads. I wasn't going to do the beads but changed my mind. I don't have a clue what I'm going to do with a mega sparkly shawl, but it is sure a challenge, and is pretty. I love the look of your yarn. It is a little fuller than mine. Yours is beautiful! 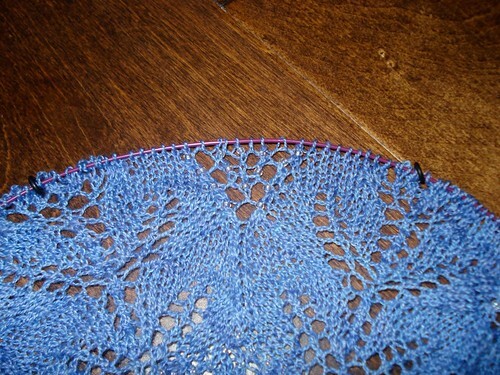 I'm working on this one too, it is the most fun knitting I think I have ever had. I love the beads and the pattern is gorgeous. I, too, am working on In Dreams. I'm about 2/3s of the way through the 2nd clue and loving it! Mine is a much paler shade of blue. Looks like you're about 6 rows ahead of me. I noticed last night that my yarn seems to be crocking a bit too. But it sure it pretty.